The Common Law Admission Test- 2016 was conducted by RGNUL, Patiala on 8th of May from 3 PM- 5 PM. 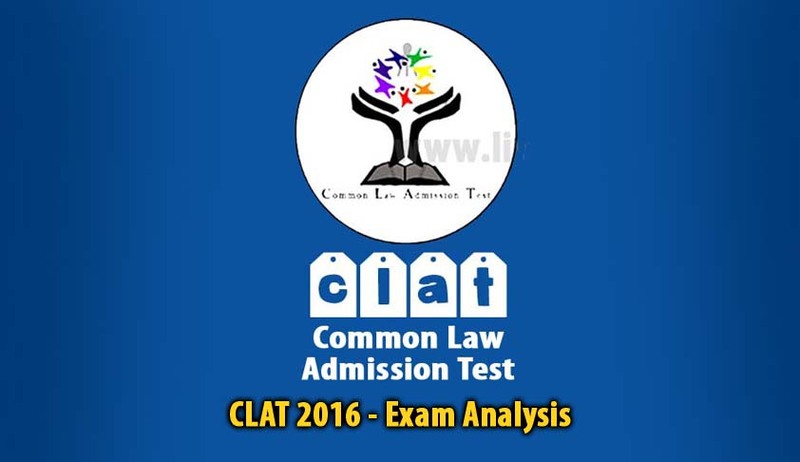 As per the students CLAT 2016 was quite easy, perhaps easiest of all the previous CLAT papers. RGNUL ensured that the registration process was smooth and hassle free and included specific time period for representation relating to the answer key. This has been done for the first time. The enforcement of the BCI notification by the Courts has ensured that, there was no age limit this year as well. Project aims to make all highways free of railway crossings. Name of duke and duchess of Cambridge - Williams and Midleton. What constitutes the Indian Parliament? President, LokSabha, RajyaSabha. A good attempt in this section would be around 46 questions with a net score around 42. Anirudh Vijay, whose CLAT center was in Jaipur, stated that, “Major portion was from Current Affairs of 2016, in fact a question was asked about the Uttarakhand Issue of 6th May!” Anirudh attempted around 160 questions. Much to the relief of all the students, the pattern of Legal Aptitude section was different from the last year. Out of the 50 questions, 35 were Principle- Facts and 15 were Legal GK questions. The majority of the students stated that the Legal Reasoning questions were easy to moderate and were not time consuming. All the legal reasoning questions only had a single principle and were easy to answer. Legal GK was pretty basic and the questions that were asked included 100th Amendment, 99th amendment, chairman of Niti Aayog. "Overall, a good attempt in this section would have been around 42- 46 questions with a net score of around 40- 42." This section was a bit tougher than the other sections and difficulty level would be moderate. There were questions on Statement Assumption, Cause and Effect, Analogy, Odd Word Out, Syllogism, Logical consistency. There was one question on visual reasoning as well wherein there were a set of four squares with a pattern, we had to guess the fifth, though the official syllabus has specifically excluded that. Those who practiced from the past papers, would have find this section easy. An attempt of 33- 35 questions and an overall score of around 30 would be good. "Overall, a good attempt in this section would have been around 34- 36 questions with a net score of around 32- 34." Many students felt that English was the easiest section of all. There was a passage comprising of 10 questions, Idioms, Spellings and Vocab based questions. Meanings of words such as accomplished, endorsement, Pedagogy, ab initio, alibi, persona non grata were asked. There were no surprises this time and the questions were very easy. This was the easiest section. An ideal attempt in this section would be 36- 38 and with a net score of 33- 36. This section was tricky and lengthiest of all. Questions were from Simple Interest, Ratio, Percentage, Probability, Averages, Profit and Loss, Clocks, etc. Attempt should have been around 12- 14, with a score of around 10. Nevertheless, this paper was a breeze of fresh air after the CLAT 2015 paper. Almost everyone was happy after the exam. Considering the paper, an attempt of around questions would be good. The paper with the answer key would be released on 12th May. Mohit Diwakar is a law student at NUJS who mentors CLAT aspirants through his Facebook Forum CLATHead.